Maggie Hassan celebrated her re-election with her husband Tom at her side at her election night rally in Manchester, N.H.
CONCORD, N.H. — Democratic Gov. Maggie Hassan defeated Republican businessman Walt Havenstein on Tuesday to win a second term in office after a campaign dominated by the economy. 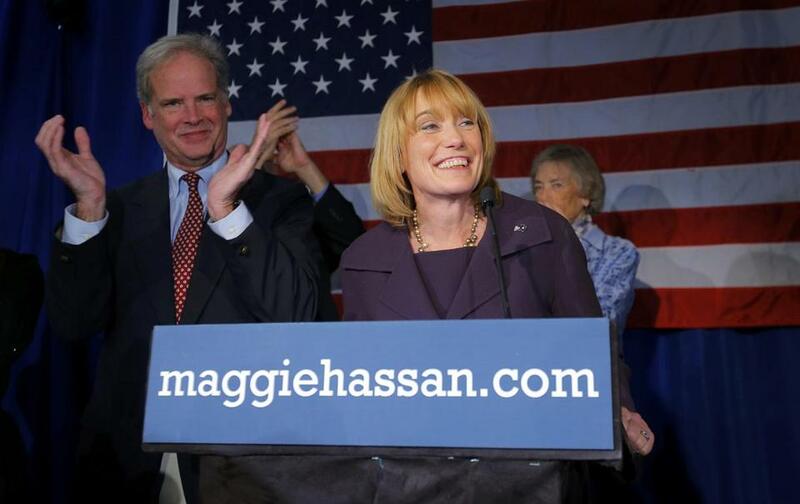 Hassan, leading into the final days of the campaign, was never down in the polls. She also outraised Havenstein, who loaned his campaign about two-thirds of his total $3 million haul. The state’s economy played prominently in both campaigns, with voters listing personal finances and the economy as their top concerns. The 56-year-old Hassan focused on bipartisan achievements such as freezing college tuition and improving infrastructure, which she said are keys to building a stronger workforce and helping businesses create jobs. She also ran on expanded access to health care through the use of federal Medicaid money. Havenstein centered his campaign on his experience leading defense contracting companies BAE Systems and Science Applications International Corp. He promised to create jobs by lowering business taxes, but Democrats repeatedly attacked him for leading SAIC while the company lost jobs and was the subject of a fraud investigation. Havenstein pointed to the state’s 0.9 percent gross domestic product growth in 2013 as evidence that Hassan’s policies weren’t doing enough to stimulate growth. He also said Hassan had poorly managed the state budget, an argument that lost some wind when the fiscal year 2014 budget surplus came in just $7 million short of the projection. Senate Republicans had predicted a $100 million budget shortfall. Hassan, meanwhile, focused her campaign on bipartisanship, pointing to a budget that overwhelmingly passed both legislative chambers and somewhat controversial bills such as raising the gas tax and expanding Medicaid that also passed with support from both major political parties. Throughout the campaign, Hassan talked in broad strokes about her vision for her second term in office, focusing on ideas such as helping businesses create jobs and ‘‘moving New Hampshire forward.’’ She has not been specific about legislative priorities, but when asked she said she’ll continue to fight for raising the minimum wage and legalizing a high-end destination casino. Hassan broke from her predecessor, Democratic Gov. John Lynch, in supporting a casino. But she was unable to convince the New Hampshire House to approve casino gambling, something it has never done. This election was Havenstein’s first run for public office, and he stumbled out of the gate amid questions about his residency. Havenstein lived part time in Maryland from 2009 to 2011, which Democrats said barred him from running for governor under a law that says candidates must live in New Hampshire for seven years before running. The Ballot Law Commission ruled he was eligible to run, but that led to accusations that he owed back taxes in Maryland.